Save your clips and images to your Camera Roll from the iPhone app. 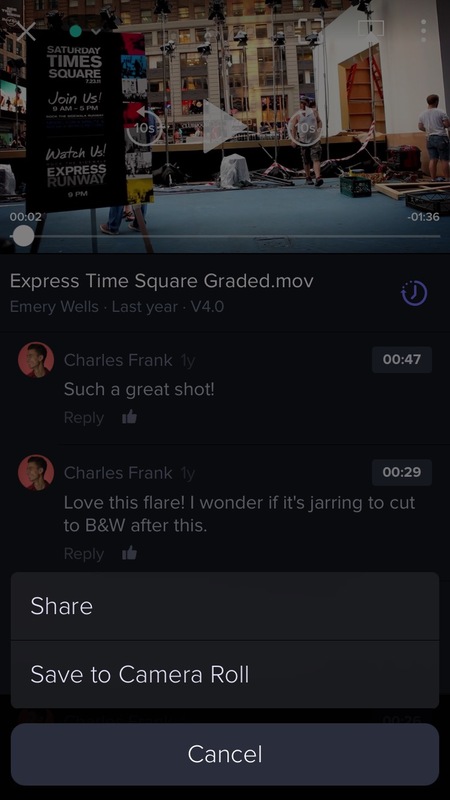 To download a video/image, open the file in the player page then tap the three dots at the top right - select Save to Camera Roll to have the option for download the original full resolution clip or a proxy version. If the file is greater than 20MB, you'll be asked to confirm if you really want to download it. If you have disabled downloading permissions for Collaborators this will also prevent them from saving files to their Camera Roll. Please note: PDFs, Word Docs, and other non-media file formats will not be available to download to your Camera Roll.